Date slicer: You use the standard slicer, and add a date field to it. When you do this, by default the slicer shows as a date slicer that lets you set the start and end date for your date. You can either use the sliders to set the dates or pick the date using a calendar. Report gridlines and snap to grid (Preview): This feature will allow you to enable gridlines on your report canvas while authoring, as well as the option to enable snapping to those gridlines.To enable the preview feature, navigate to File > Options & Settings > Options > Preview Features. Check the “Gridlines and Snap to Grid” box and restart the Desktop. Data label improvements: For column charts, you now have the option to change the orientation of your data labels between horizontal and vertical. For bar, column, and waterfall charts, you can also change the position of the data labels so they will show up at specific locations and can control how dense the data labels are. Map formatting options:There’s a new card in the formatting pane on the map visual that allows you to control the size of the bubbles. Moreover they added the capability to disable auto zoom on the map and filled map visuals. This will allow you to set the zoom level and have it stick, even if you are cross-highlighting the data using other visuals or slicers on the report. Improved date axis range formatting: you now can modify the start and end dates of your axis using a date picker. This makes setting your axis range much easier and faster than it was previously. Grouping: Add the ability to group up points on your visual to help you more easily explore and analyze related categories. To use the feature, select one or more points on a visual using Ctrl+Click, right click one of the points, and select Group from the context menu.You can edit existing groups by right clicking an already created group and selecting Edit Groups… from the context menu. Binning: you can also now use binning on numerical and time fields. For example, if you have a SalesAmount field in your data and you want to see the user satisfaction across different sale sizes, you can use binning to create these sale size groups. You can access binning by right clicking on the field and clicking Group. you can define the bin size. Top N filter: It’s work like a filter,You can specify that you’d like to filter by the Top or Bottom number of categories, sorted by a specific measure. You will find the Ton N filter in the filter pane as a Filter Type option for the category field you want to filter down. You add the measure you want to filter with by dragging it into the By value bucket. Include/Exclude data points: You can now select one or more points and right click to include or exclude points in your visual.Include will filter out all points except for those you’ve chosen to include. Exclude will filter out the points you’ve chosen to exclude. R-powered custom visuals: Now, you can simply download a pre-built R-powered custom visual from the custom visual’s gallary instead of having to build it yourself. Download R-powered custom visuals from http://app.powerbi.com/visuals under the R-powered visuals tab. Microsoft Dynamics 365 for Financials: The connector can be found under the “Online Services” category. OLEDB: The new OLEDB connector can be found under the “Other” category within the “Get Data” dialog. Mixpanel: This new connector allows users to pull mobile and web analytics data from their Mixpanel accounts, in order to visualize it and create reports within Power BI. 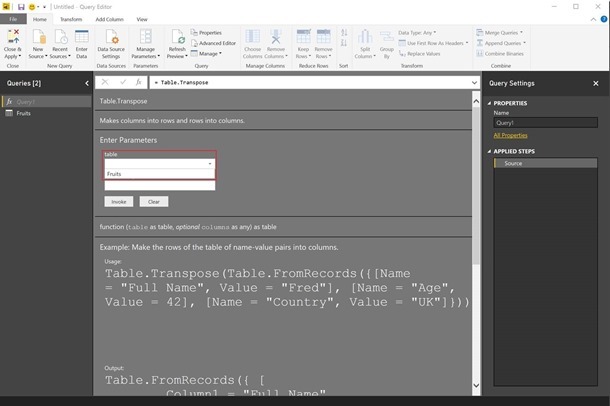 Support for table parameters in “Invoke Function” dialog: When invoking a function that accepts a table parameter, either a built-in or user-defined function, you will be able to select an existing table query as the input value to the function.The following screenshot shows the “Invoke Function” experience for a built-in function, such as Table.Transpose. Diagnostic information in the “About” dialog:You can now easily copy your session ID and diagnostic info to your clipboard. You can find this diagnostic information under File > Help > About.